In the new zoo, live animal exhibits — red pandas, prairie dogs, turtles, waterfowl, and a deer species called muntjac — will be accompanied by educational play structures that mimic natural habitats. John Linehan didn’t invent the term “nature deficit disorder,” but he’s determined to find a cure for it. The phrase, coined by the writer Richard Louv in his 2005 book, “Last Child in the Woods,” refers to the negative consequences of spending less time outdoors and more inside with our devices. As chief executive of Zoo New England, the nonprofit that runs Franklin Park Zoo in Boston and Stone Zoo in Stoneham, Linehan hopes a new children’s zoo in the works at Franklin Park will be part of the remedy. The old children’s zoo, now closed for renovations, was “a hodgepodge of different exhibits in various states of decay,” said Linehan, a man not inclined to sugarcoat bad situations. It’s also intended to feel quite different than the previous children’s zoo, where kids could look at animals but not do much more. In the new zoo, for example, live animal exhibits — red pandas, prairie dogs, turtles, waterfowl, and a deer species called muntjac — will be accompanied by educational play structures designed to mimic the animals’ natural habitats. Visitors will be separated from some creatures by a moat and a glass barrier, rather than mesh fencing, offering a clearer view and a more immersive, interactive experience. 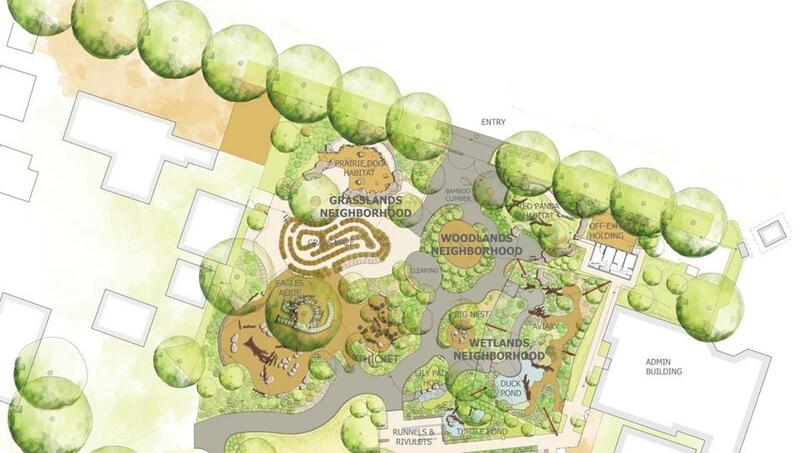 Priced at about $7 million, most of which will be funded by Zoo New England’s recently completed capital campaign, the new children’s zoo will be called Nature’s Neighborhoods and feature several different “experience zones,” including woodlands, wetlands, grasslands, and thicket. Each one is designed to convey the importance of a diverse ecosystem. “We want to teach kids that a healthy neighborhood has lots of different people who do things for our lives, from teachers to policemen to doctors to people who pick up the garbage,” Linehan said. The exhibits will also allow so-called adventure play. In the red panda setting, children will get to shimmy up bamboo-like structures, and in the “Eagle’s Aerie,” they can climb atop a viewing platform that offers the same bird’s-eye view that raptors have, and then “soar” down a spiral slide. “We need to start earlier getting kids oriented toward nature and appreciating the incredible biodiversity of the planet,” Linehan said. Follow her on Twitter at @SachaPfeiffer.